… and those who were in the plot ran to it and slammed down the lid, which they fastened by nails from the outside. … They say also that the date on which this deed was done was the 17th day of Athor [27 November], when the sun passes through Scorpion. The events of 17 Hatoor/Athor (27 November), as reported by Plutarch, have all the elements of the biblical Jesus’ Last Supper, i.e. a conspiracy, feast, friends, and betrayal. The Loss of Osiris is now celebrated in the Abu Sefein (reference to Osiris’ two emblems—the crook and the flail) Festival in Egypt at the same date and with the same traditions, i.e. a big feast followed by a 40-day cycle of figurative death by fasting and other disciplinary means. 28 days after the Last Supper is the birth/re-birth of the renewed king on 25 December. 40 days after the Last Supper is Epiphany (6 January). Osiris’ life, being a symbol of the moon [see Chapter 13], is associated with a cycle of 28 days (4 weeks). This was echoed later in the Christian Advent, which in Latin is ad-venio, meaning to come to. The Catholic Encyclopedia admits that: “Advent is a period embracing 4 Sundays. The first Sunday may be as early as 27 November, and then Advent has 28 days.” As noted above, 27 November is the date of the symbolic Last Supper, Death, and Loss of Osiris. The 28-day cycle of Osiris and its relationship to the regeneration principle is nicely depicted in the famed scene of the resurrection of the wheat, which depicts Osiris with 28 stalks of wheat growing out of his coffin. All the above elements are of Ancient Egyptian origin. Such traditions were observed during (and in fact were based on) the annual jubilee of the Ancient Egyptian King, known as the Sed (or Heb-Sed) Festival, which was always held during the month of Kee-hek (Khoiakh, i.e. December) every year. This festival dates from time immemorial, and continued to be celebrated throughout the Ancient Egyptian history. The intent of this annual event was the renewal/rejuvenation of the supernatural powers of the King. The renewal rituals aimed at bringing a new life force to the King, i.e. a (figurative) death and a (figurative) rebirth of the reigning King. 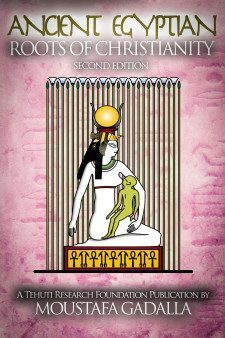 In the Ancient Egyptian traditions, this concept of perpetual power (between the old and the new) is eloquently illustrated and shown earlier in this book in the depiction of Horus being born out of Osiris, after Osiris death. This gives more meaning to the phrase: The King is dead—Long live the King. In the Ancient Egyptian traditions, the rejuvenation/birthday of a new/renewed King comes symbolically 28 days after 27 November—the symbolic Last Supper and the Death of Osiris—i.e. 25 December. The Christian calendar celebrates the same day as the birth (rebirth) of the new King, namely Jesus, who is referred to as a King throughout the Bible. The 28-day cycle signifies the Advent (both in Ancient Egyptian and Christian traditions) of the King. All the elements mentioned in the Catholic Encyclopedia on the previous page concur with their Egyptian origin, whereby Osiris incarnates as Horus, and that Osiris is the judge of the dead. As stated earlier, typical Egyptian festivals extend for an octave-week. As such, the Egyptian King’s renewal day of 25 December (Julian calendar) has its climax in its octave (8 days later) on 1 January—the New Year’s Day for the rejuvenated King. On the 22nd of Kee-hek/Khoiakh (1 January), during the annual jubilee festivities, a special ceremony was held, at which a ceremonial voyage was led by the effigy of Osiris, accompanied by 34 images of divinities in 34 little boats illuminated by 365 candles (the candles represent the number of days in a regular year). When Julius Caesar came to Egypt in 48 BCE, he commissioned the astronomer Sosigenes (from Alexandria) to introduce a calendar into the Roman Empire. This resulted in the Julian calendar of 365 days a year and 366 days every leap year. The Roman (Julian) calendar was literally tailored to be fit for a King. The first day of the year was the coronation day for the Egyptian King at the end of the annual rejuvenation Jubilee—the Heb-Sed Festivals. A cycle of 40 days after the Egyptian Last Supper (27 November) and the death of Osiris was/is the Epiphany on 6 January, which was later adopted in the Christian calendar of events for the same objective. Like the Ancient Egyptian traditions, the original intent of Epiphany in the Eastern Church is for one about to be baptized—the sacrament of Baptism. As stated earlier, baptism represents figurative death and rebirth. A born-again cycle typically takes 40 days (from 27 November to 6 January). At the end of the cycle, the people bathe in the Nile (baptism), and the fast is broken. Happy days are here again. Baladi Egyptians (who were forced to be Moslems) continue to celebrate this occasion because it is an Ancient Egyptian tradition that was later adopted by the Christians. Lent denotes the 40 days’ fast that precedes the Holy Week of Easter. One has to (figuratively) die in order to be (figuratively) reborn. Lent represents the figurative death (fasting, self-discipline, etc.) before rebirth. Lent and Easter pre-date Christianity, as explained below. Lent was, in origin, the time of the final preparation for candidates for the solemn rite of baptism at the Easter Vigil. The ritual of baptism was performed in the sacred lakes of the Ancient Egyptian temples and in the River Nile itself. It has been common knowledge that the Christian Easter was not a historical event, but that the festival preceded Christianity. The Webster’s dictionary describes Easter as the “name of pagan vernal festival almost coincident in date with paschal festival of the church”. The so-called “pagan” festival is the Egyptian Easter. In the Egyptian (and later the Christian) calendar, Easter is the center of the greater part of the ecclesiastical year—from Septuagesima to the last Sunday after Pentecost, the feast of the Ascension, Pentecost, Corpus Christi, and all other movable feasts—because they are tied to the Easter date. Commemorating Easter is the cornerstone upon which the Christian faith is built. Yet the Apostolic Fathers do not mention it because it was a continuation of an existing Jewish holiday—namely Passover—which in turn was/is an adoption of an Ancient Egyptian Spring festival. Ancient Egyptian records indicate that the Egyptian Spring Festival was in existence for over 5,000 years. The purpose of such festival was/is the renewal of nature in the springtime, when life returns once more to the world. As stated earlier, Osiris represents the cyclical nature of the universe, the principle that makes life come from apparent death. It was therefore natural that Osiris be identified with Spring—of the day when he was believed to have risen from the dead. More than 5,000 years ago, Ancient Egyptians adopted a national holiday, which came at the end of an 8-day festival. According to Egyptian allegory, Osiris died, was buried and then disappeared on the fifth day—Friday Eve. They called that day the Loss of Osiris. Osiris was resurrected three days later, i.e. on Sunday, as the judge (king) of the dead. As is the case of the Egyptian Osiris, the Christian Easter reflects the Christian conviction that Christ died, was buried, and subsequently disappeared on Friday; and was resurrected the third day after his death, on Sunday. It is the happiest day in the Christian calendar. The Easter celebration, like all Egyptian festivals, lasts an octave-week (known in the Christian calendar as the Holy Week, extending from Palm Sunday to Easter Sunday). The Ancient Egyptian Holy Week is followed by Easter Monday—known in Egypt as Sham en Neseem. This is the only official national holiday that has survived uninterrupted since Ancient Egyptian times. In the Ancient Egyptian tradition, the spirit of the deceased takes 40 days to completely depart the body and ascend to the heavens. Accordingly, the mummification (body dehydration) period lasted 40 days. Likewise, the Christian calendar commemorates Ascension Day on the 40th day after Easter, when it celebrates “the bodily ascent of Jesus into Heaven, on the 40th day after resurrection”. The Apostles (Prophets) annual Festival in Egypt is held 50 days after Easter. Likewise, in the Christian calendar, the faithful celebrate Pentecost, which happens 50 days after Easter. Pentecost celebrates “the descent of the Holy Spirit upon the Apostles”. This festival is of Ancient Egyptian origin. Pentecost signifies the period of the Khamaseen (meaning The Fifty) when the southerly hot and reddish sandstorms and winds are of frequent occurrence. This annual event commences on the day immediately following Good Friday (Easter [Light] Saturday), and ceases on the Day of Pentecost (or Whitesunday)—an interval of 50 days. This Pentecostal event is related to the Ancient Egyptian allegory about Isis and Osiris. The 50-day period represents the oppressive rule of Seth, after Osiris was dethroned. Seth represents the color red and the oppressive weather that is dry, fiery, and arid. In essence, Seth represents the red, hot cloud of dust—Khamaseen. The allegory continues that as soon as Horus had grown to manhood, he challenged Seth for the right to the throne. After several battles between them, they went to the council of the 12 neteru (gods, goddesses) to determine who should rule. The council decided that Osiris/Horus should regain the throne of Egypt, and Seth should rule over the deserts/wastelands. In weather terms, this decision by the council ended the 50 days of oppressive weather (the Khamaseen). The date of judgment by the council of neteru/apostles/prophets was declared to be Whitesunday (White-Sunday), meaning the 50 reddish days are over; it’s all clear, now. After Osiris ascended to the heavens, Isis began weeping. The Eve of the 11th of the Ancient Egyptian month of Ba-oo-neh (18 June) is called “Leylet en-Nuktah” (or the Night of the Tear Drop), as it commemorates the first drop that falls into the Nile, to begin the annual Nile flood season. In the sacred hymns of Osiris they call upon him who is hidden in the arms of the Sun; and on the thirtieth of the month Epiphi [6 August] they celebrate the birthday of the Eyes of Horus, at the time when the Moon and the Sun are in a perfectly straight line, since they regard not only the Moon but also the Sun as the eye and light of Horus. This is identical with the later Christians’ claim of the transfiguration of Jesus, celebrated by the Orthodox church on 6 August. This holiday commemorates the “revelation of Jesus’ divinity to Peter, James, and John”. This Ancient Egyptian tradition continues, camouflaged in the Mouled of El-Desouki, at the town of Desouk, on the east bank of the westerly branch of the Nile River. El-Desouki is lovingly known as Abu-el-e-nane (of the two eyes), just like Horus the Elder of the Two Eyes. This annual Egyptian festival is recognized by the best magical (divination) acts in Egypt, which corresponds to the later Christian celebration whose main theme is the “revelation of (Jesus) divinity”. The 15th day of August is a national holiday in many countries, commemorating the Ascension of the Virgin Mary to the heavens after her death. On the very same day—15 August- the Egyptians have been commemorating, since ancient times, a very similar festival that relates to the (symbolic) death of the Ancient Egyptian Virgin Mother, called Bride of the Nile. In the Ancient Egyptian context, the Bride of the Nile is Isis, the Virgin Mother, and the River Nile is her soul mate, Osiris. On 15 August, the Ancient Egyptian festival commemorates the end of the 50-day rainy period in Ethiopia, which causes the annual flooding of the Nile. The Egyptians associate the beginning of the annual flood season with Isis, who began to weep after her soul-mate, namely Osiris, ascended to heaven 40 days after his death. Egyptians associated Isis’ first teardrop with the beginning of the rise of the Nile. Isis continued to weep, wishing for the lifeless Osiris to rise again. The Weeping Widow became, for the Egyptians, the Lady of Sorrow. One of the most compelling parts of this Egyptian popular folktale is how these two symbols relate to the flood season in Egypt. The beauty here is that Isis wishes for Osiris (symbolizing the water) to rise from his coma, and the water of the Nile consequently rise as a result of her weeping. Isis therefore recreates/regenerates Osiris from her tears every year. Her tears are blood-red in color, which is the same color of the floodwaters, since this water comes as a result of the rainy season in Ethiopia which erodes the silt of the Ethiopian highlands and carries it towards Egypt along the Blue Nile and other tributaries. So, Isis’ tears represent this reddish color of the water during the flood season. In essence, Isis is crying a river—so to speak. The Christian faithfulls follow the same Ancient Egyptian traditions in their presentations of the statue of Mary with bloody teardrops coming out of her eyes. In this popular Egyptian allegory, Isis finished her crying over her soul mate, Osiris in about the middle of August, which means that Isis cried all the tears she had. It is at this point in time that the Egyptians (both ancient and modern) hold a festival, signifying the last teardrop from Isis, which will cause the peak of the flood level. It is during this celebration that the Egyptians throw an effigy of Isis into the waters to symbolize that Isis drowned in her own tears—the River Nile itself. In addition to the official governmental celebrations, the Baladi Egyptians hold an annual festival called Sitena Meriam (meaning: Our Lady Meriam). This is not a “Christian festival”. The festival lasts the typical Egyptian octaveweek (8 days). It begins on 15 August and ends on 16 Mesoree (22 August). The Ancient Egyptians followed the Sothic year, a period of 365.25636 days. Besides the adjustments made for the 0.00636 days per year [see details in Appendix E of our book, Egyptian Mystics: Seekers of the Way], the Ancient Egyptians divided the year into 12 equal months of 30 days each and added five (plus one every 4 years) extra days. These extra days currently begin on 6 September. In the typical Egyptian story form, five neteru (gods) were born on each of the five days—Osiris, Isis, Seth, Horus Behdety (Apollo), and Hathor. The Nativity of the Virgin Mary is celebrated in the church on the Eve of 8 September, which is Isis’ “birthday” as the second of 5 deities born in the 5 “extra days”. 40 days after Isis’ (Mary’s) birthday is the Egyptian Conception (Planting) Annual Festival. 40 days after planting the seeds, the Egyptians celebrated/celebrate the event of the Last Supper and the Loss of Osiris. And the orderly observation of cycles goes on, to maintain synchronism between the Below (on earth) and the Above (in heaven).